This exercise was to demonstrate the range of focus within an image taken with varying apertures. 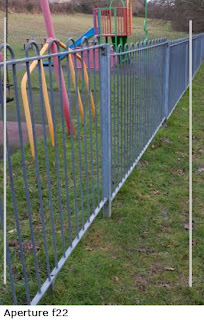 For this exercise I took three photographs of the railings at a local park at f2.8, f7.1 and f22. 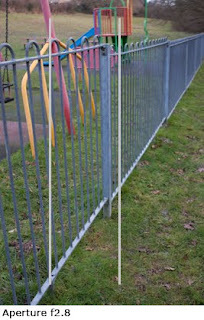 The slides and swings in the background also proved to be a useful measure of what was in and out of focus also. The area of focus within the images is the area between the two white bars. 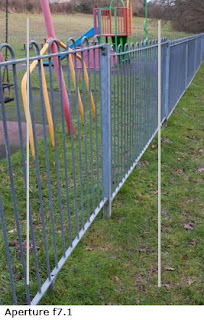 The first image at f2.8 shows a narrow band of focus, this is also visible not only in the railings but also the tower in the background. The second image at f7.1 is the mid point of the lens producing the best sharpness in the mid ranges, this gave a good overall focus, noting the tower now in focus, however the far railings are still out of focus when magnified. It is therefore clear that a higher f-stop or smaller aperture will produce an image with a greater range of focus, whilst a lower f-stop or larger aperture will create a narrow field of focus around the focal point of the image.